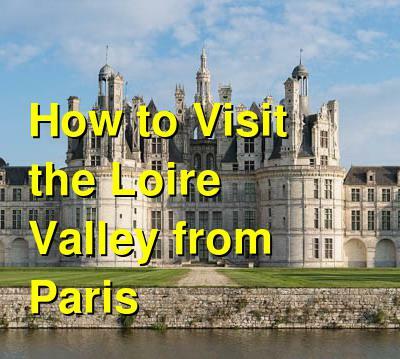 The Loire Valley is full of history, culture, castles, wine, and food. So, it's no wonder that it's one of the most popular destinations in France! And it doesn't have to be difficult to get to, either. Just a few hours south of Paris, the Loire Valley has several top-notch sights and attractions that are located near several major cities. The main problem is that everything is fairly spread out, so sometimes it's best to prioritize what you want to see. Another option, though, is to find a tour that takes you exactly where you want to go so that you don't have to deal with all of the complex transportation options. Why spend time waiting for trains and buses when you can see everything in a much more efficient way? Here are several options that can take you around the Loire Valley region at an affordable price. Get a great overview of the Loire Valley with this Wineries & Castles day trip tour from Paris. First, see the Chateau of Chambord, then have lunch at a family-run winery of the Touraine Wine region, and finally visit a second winery with a tasting of delicious wines! At the end of this 11-hour wine & history tour, you will be truly impressed with Chambord's impressive architecture, and also with the wonders of Loire Valley wines. After an early morning hotel pick-up in Paris, a comfortable van will take you 2 hours south to Chambord Castle. On your way, you will enjoy fresh croissants while the English-speaking guide provides you with information about the winemaking region of La Loire. The first stop in the morning will be the Chateau of Chambord with an audio-guided tour. Your tour will tell you about the secrets behind this amazing Castle constructed by King Francis I of France in the early 16th century. Once back in the van, you will pass through the vineyards of Touraine, Vouvray, and Montlouis-sur-Loire along the way. Admire the stunning landscapes full of Chenin Blanc, Sauvignon Blanc, and Cabernet Franc grapes. Then, sit at a wine grower's table in a Vouvray winery. Meet the winemaker, and then enjoy a delicious meal with some traditional French food. And Yes, there will be even more wine tasting with lunch! After lunch, explore another family-run winery while you taste sparkling white wines, plus dry and sweet white wines, as well as red and rose wines (the type of wine depends on the winery visited). Here, you can taste authentic Loire Valley wines, many of which are unavailable to the rest of the world. Enjoy this day tour from Paris to three of La Loire's famous castles, dating back to the renaissance. See first-hand many of Leonardo da Vinci's inventions at Amboise, then learn about the 6 women of Chenonceau, and explore the royal chambers of Chambord Castle before climbing the famous double helix staircase. You'll start the tour in the morning with a visit to Amboise, the castle where Leonardo da Vinci was invited by Francois I to live and work. During the visit, you will be able to see all of the artist's unique and inspiring inventions. After enjoying lunch, the van will take you to the well-known Chenonceau Castle, built on the River Cher. Known as the "Chateau of the 6 Women," various ladies, including Catherine de Medici, played an important part in the history of the castle. All of this history will be part of your tour, of course! Next, you'll continue to Chambord Castle, famous for its double helix staircase. Here you can explore the royal apartments of King Francois I and King Louis XIV. On this tour you can have the opportunity to visit two of the finest castles of the Loire region, Chambord and Chenonceau. Also, enjoy a wine tasting session in this lush, fertile landscape, responsible for some of the world's greatest wines. The Chateau de Chambord is the perfect example of French Renaissance architecture. This remarkable structure was built by King Francois I between 1519-1547, and is the largest chateau in the Loire Valley. Next on the trip is the charming Chateau de Chenonceau, a true fairy tale castle set perfectly on the Cher River. The site of the first ever French fireworks display, Chenonceau is really one to fall in love with. Finally on this tour, enjoy a wine tasting session. On this tour, similar to the others, you can take a day tour from Paris to visit some of the most famous castles of the Loire Valley (Chambord and Chenonceau), as well as have a wine tasting at a local winery. Fall into the glamour and grandeur of the days of French royalty as you learn about the history of these amazing Renaissance castles. Also enjoy a wine tasting session in this lush, fertile landscape, responsible for some of the world’s greatest wines.